The Green Fire is Luigi's kart in Mario Kart: Double Dash!! 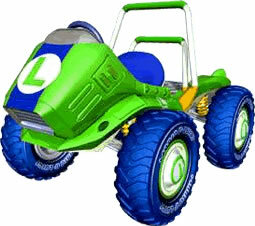 It is a green version of Mario's kart, the Red Fire, with a green paint job, darker blue wheels, and Luigi's trademark L replacing the M on the front of the kart, on the wheels, and the tire hubcaps. This kart can be unlocked by completing the Mushroom Cup on 50cc. By its stats, Luigi's Green Fire is the only middleweight kart that possesses a high speed stat, and the only kart with good steering for being speedy. However, its acceleration and weight are low for a middleweight kart. It has the highest top speed and the weakest acceleration among middleweight karts. It is also seen with the worst off road of all middleweight karts. Despite having below average weight, the Green Fire can easily push the Koopa Dasher and Para-Wing around. Even Daisy's Bloom Coach can be pushed around by this kart. However, the Green Fire, along with the Bloom Coach, can easily be pushed around by Diddy Kong's Barrel Train kart, which is a lightweight kart. Although its acceleration stat displays two stars, the Green Fire actually accelerates the quickest of all the two star acceleration karts, beating even the Barrel Train, but its top speed is only tied with that of the Wario Car and Parade Kart. This page was last edited on February 5, 2019, at 09:06.